Bali Property owners considering renting out their space often wonder whether it would be better to use their property as a short-term rental (holiday rental) or as a long-term rental. Owners should consider their wants and needs, as well as factors like revenue, rental maintenance, and property usage when deciding to rent short or long-term. Here, Paradise Property takes a closer look at the differences between the two rentals to help you make the best decision for you and your rental business. 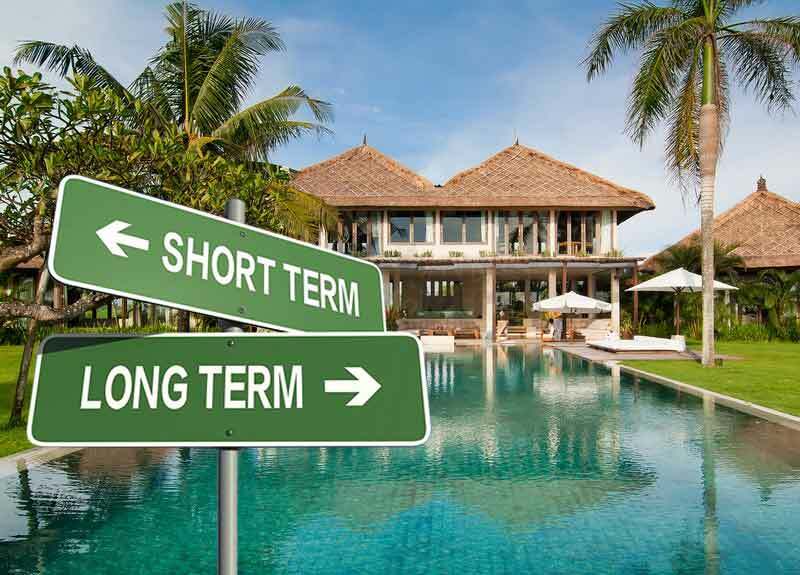 What is the difference between short-term and long-term rentals? A short-term rental, or holiday rental, is the renting out of a furnished house, villa or apartment for a short-term stay. The owner of the property usually will rent out on a weekly or monthly basis, but some holiday rentals offer nightly rates. The owner of the property will rent their space when they are not using it – although some rentals may have shared spaces – especially during peak holiday seasons like in December or for New Years and times over the school holidays when higher rates can be applied. It’s also become common for people traveling for festivities or special events like birthdays or anniversaries, to rent villas rather than pay for over-the-top expensive hotel rates. Short term rentals have surged in popularity in recent years for many reasons, especially because they often offer more privacy and space for a lesser cost than hotels. A long-term rental is usually anywhere from 1- 5 years . The owner of the property rents out his premises, typically receiving up-front yearly rental payments. While they may lack the flexibility of a short-term rental, they do perform better in a number of ways. The first being flexibility. The owner can choose exactly when in each month their property will be made available to guests. Consequently, owners who want more of an opportunity to use their property often prefer to rent on a short-term basis instead of long-term. Additionally, short-term rental owners might have an easier time getting away with charging higher rates, particularly around holidays and popular travel times (high season), than a long-term rental owner. In some countries, there are also tax breaks (check with your tax office) for short-term rentals in terms of not having to report certain rental income and also the opportunity to deduct property-related costs like advertising or operating. The short term rental market should be providing the owner with more rental income than renting the property out to a long term tenant. While the income may not be as consistent, if you look at the income on a year round basis, the short term market should outpace the long term, especially if it is managed well and in a good location. Since a short term rental is not occupied 365 days a year, there should be less wear and tear on the property. If there is a good property manager in the villa all the time, then the property should be kept in great condition. Also, if the owner ever wishes to sell the property, by not having long term tenants in there it allows the owner to arrange viewings and sell the property without having to deal with being tied into a long term rental contract with a tenant who may not wish to move out. When guests go on holidays, they want to relax and stay in nice places. When renting the villa out to a short term guest, the owner needs to consistently make upgrades to the property to make it more desirable for them. Also, there maybe some repairs required, servicing of appliances or replacement of items in the property, which can take a chunk out of the income. Short term guests also need to be checked in and out, cleaning needs to be arranged, the guests tend to have more issues as they don’t understand how to use equipment in the property and so on, so a short term rental requires significantly more management. Short term rental properties tend to have higher costs. The costs for utility bills are higher, management costs are higher, cleaning costs, internet & satellite TV, replacing household goods and maintenance costs all tend to be higher. By law, the owner of a short-term rental property must have a Pondok Wisata (rental licence) to operate their property as an accommodation business. With a long-term rental, the owner not only receives an up-front lump payment, but he does not have to worry about renting out his property for 12 months, so no more advertising fee’s and the utility fee’s and upkeep expenses are now the responsibility of the tenant. Once a long term tenant is living in the property, in most cases they are less hassle to deal with than short term guests. Most long term tenants who live in a property will care more about the place than the average short term tenant (also depends on how much holding deposit is held), as they will look after the place as if it were their own. The advantage of having a long term rental is that the owner does not need to have a Pondok Wisata (rental licence) to rent out the property. With long-term renting, the owner often has less flexibility choosing when to use their property since the space is rented out for longer periods of time. When the owner rents out their property, they have to wait until the end of the yearly contract before they can receive a rental income again. They also miss out on the advantages of receiving ‘High Season’ rates, since it is a set yearly price. They may also have tenants who are less than pleasing, which could upset both the owner and the neighbors. There are certain laws in place that protect long term renters, such as having to give them advance notice to inspect the property. As long term rental tenants are using the property for day to day living, they also tend to make more personal changes to the property (moving furniture, putting up pictures and so on) which can cause damage and wear and tear to the property. If you’re the owner of a villa or apartment which you are looking to rent out, you’ve come to the right place! Contact us to list your property today.